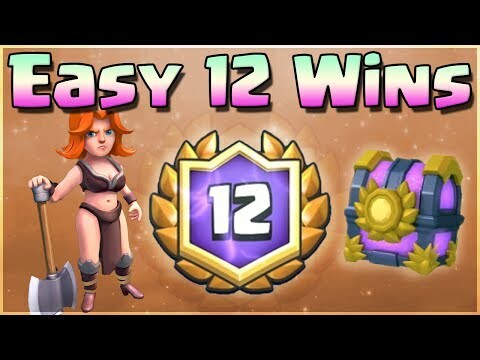 Clash Royale – Easy 12 Wins Best Challenge and Tournament Anti Meta Deck! Best Deck For Getting 12 Wins and Winning Tournaments in Clash Royale! Anti-Meta Deck. Today I’d like to share one of the best decks for getting easy 12 wins in this meta. This is a deck I got from my clan mate Whit3proud, who has recently got four straight 12 wins in Grand Challenges with this deck. What I love about this deck is just how good it is against pretty much every popular deck top players are using. Executioner is an excellent counter against Night Witch, Valkyrie is an excellent counter against Graveyard and is also very good against Three Musketeers. She’s very underrated. While Battle Ram and Bandit are our win condition, and it’s a very overpowering combo. Clash Royale – The Log Deck and Strategy with Hog Rider and Prince!